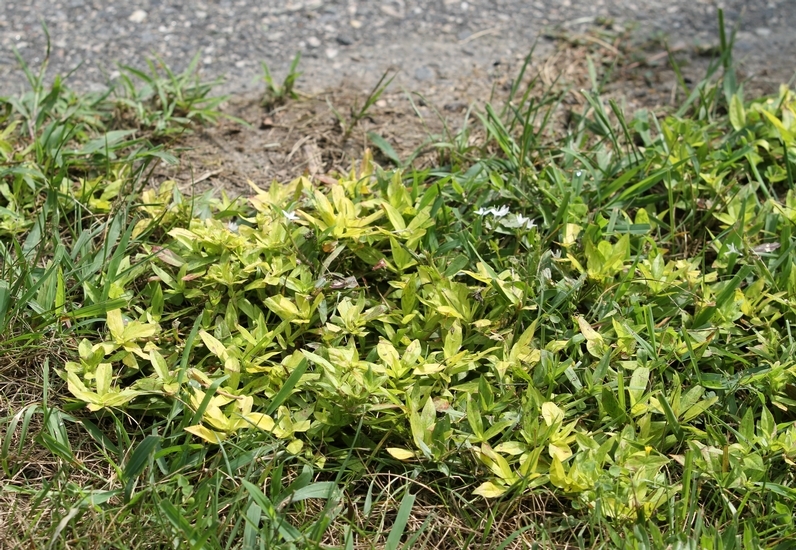 A spreading perennial weed with opposite leaves that often have a yellowish mottling due to the presence of a virus that grows in close association with this weed. 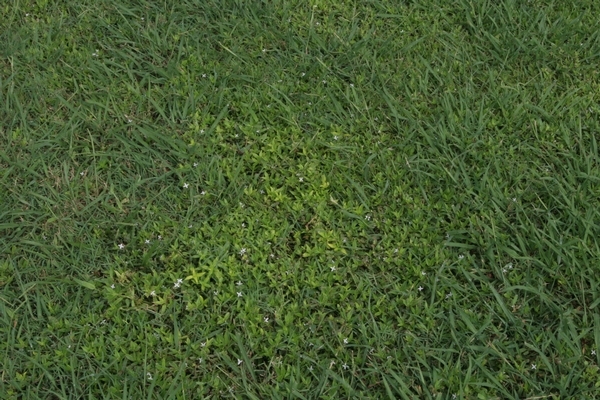 Virginia buttonweed seems to proliferate in moist or wet areas, tolerates close mowing and is a very troublesome weed of lawns and turfgrass throughout the southeastern United States. 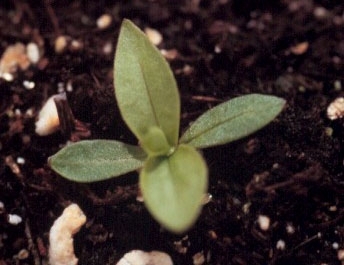 Cotyledons are thick and oblong, dark green on the upper surface and lighter green below. 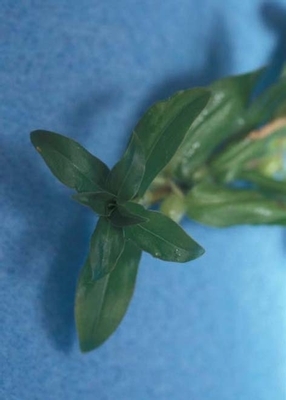 First true leaves are elliptic to lance-shaped, without petioles (sessile), and are joined across the stem by a membrane that has 1 to 3 stipules that resemble long bristly hairs. Opposite, elliptic to lance-shaped, without petioles (sessile), and approximately 1 1/4 to 2 1/2 inches long by 1/2 to 1 inch wide. Leaves often have a yellow mottling due to the presence of a virus and the leaves are joined across the stem by a membrane that has 1 to 3 stipules that resemble long bristly hairs. Usually trail along the ground but sometimes are ascending. Stems root at the nodes and are occasionally hairy. Occur in the position between the leaf and the stem (leaf axils). Individual flowers are star-shaped with four white petals and are approximately 1/2 inch wide and 9 mm long. A small, hairy capsule (5 to 9 mm) that contains 2 seeds. Flesh roots allow vegetative reproduction to occur. 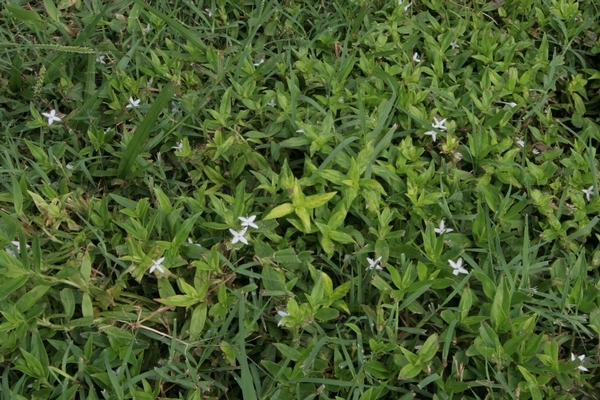 A prostrate perennial weed of turfgrass with opposite leaves and small white flowers that occur in the leaf axils. 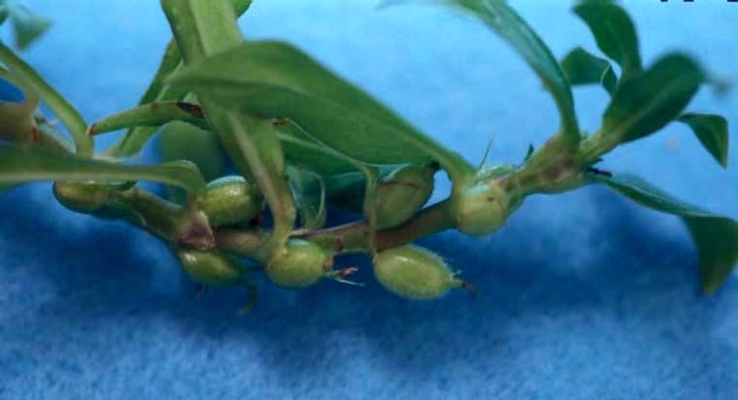 The yellow mottling that is often associated with this weed is also a characteristic that helps to distinguish Virginia buttonweed from other similar weeds. Poorjoe or Common Buttonweed (Diodia teres) is similar in appearance to Virginia buttonweed but this weed grows more upright, has much narrower leaves, and has stems that are much more hairy than those of Virginia Buttonweed. Additionally, Florida pusley (Richardia scabra) has opposite leaves and a similar growth habit, but Florida pusley has leaves and stems that are much more hairy and flowers with 6 petals unlike Virginia buttonweed.